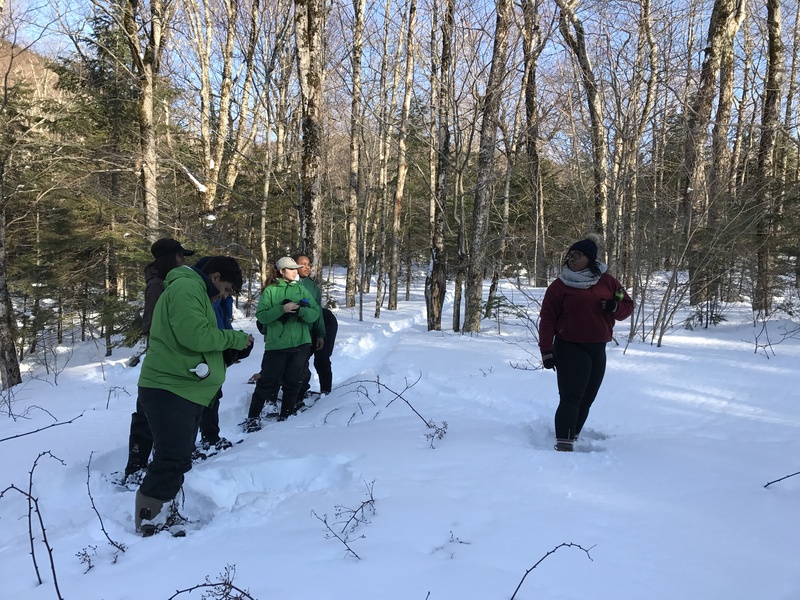 Over February break, we teamed up with the Branching Out Team from New York. 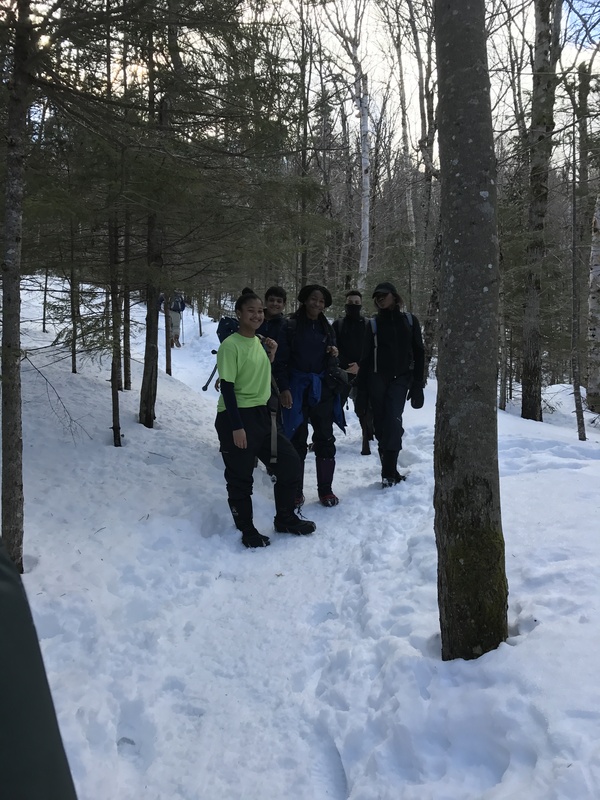 We went on a three day hiking trip that started on Saturday when we played an ice-breaker in order to learn and get to know more about the other team. Then we all loaded up the cars and set out for New Hampshire. The car ride took three hours and everyone was tired. 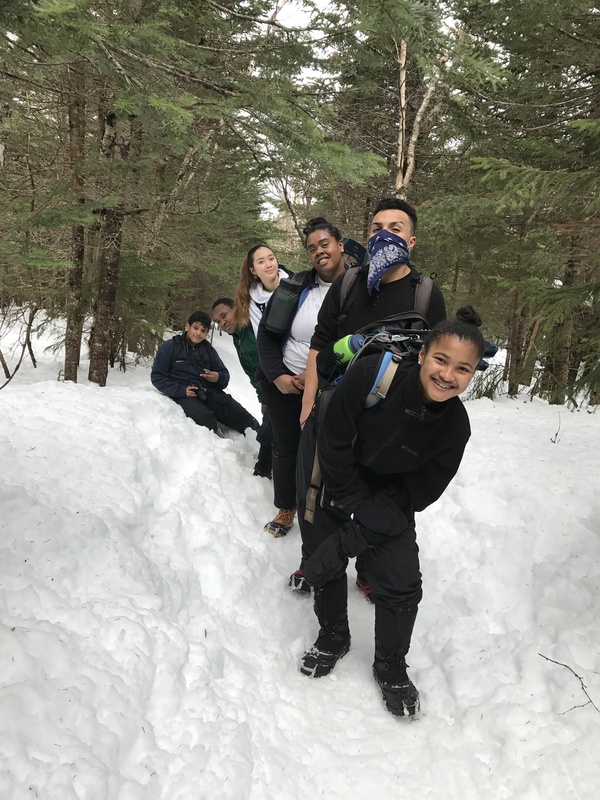 When we arrived in New Hampshire, we ate lunch and took some time to relax. The Boston branching out team had to lead a workshop to familiarize people about safety. 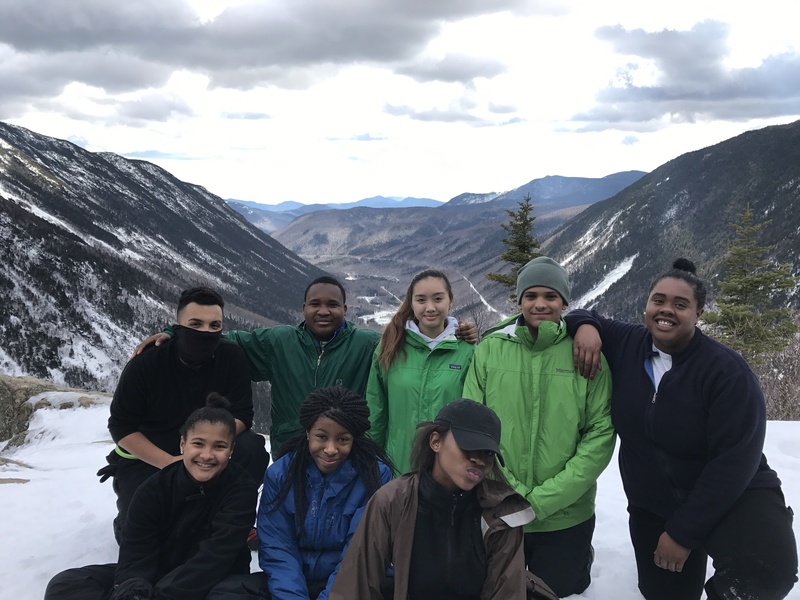 Innocent talked about how to dress properly for winter hike. 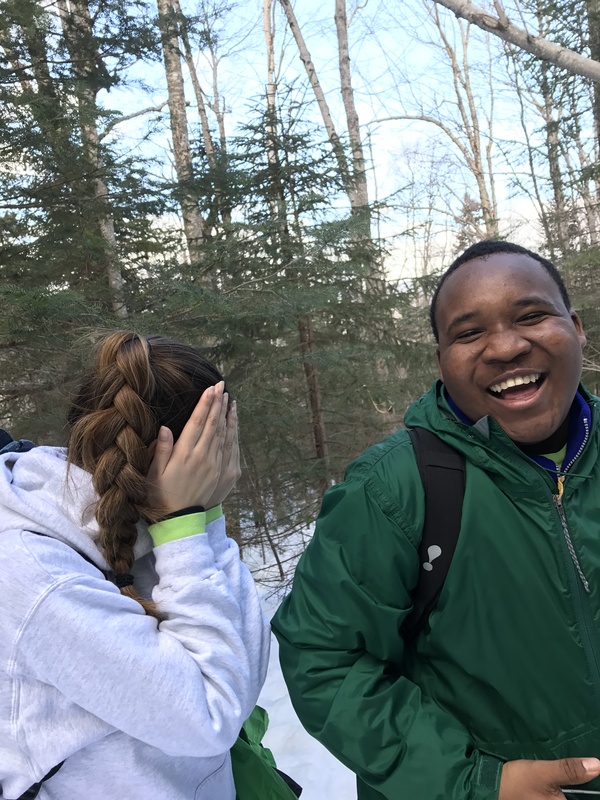 Moises talked about several illnesses like hypothermia, frost bite, and dehydration. Linda talked about food and how to fuel up for a long hike. 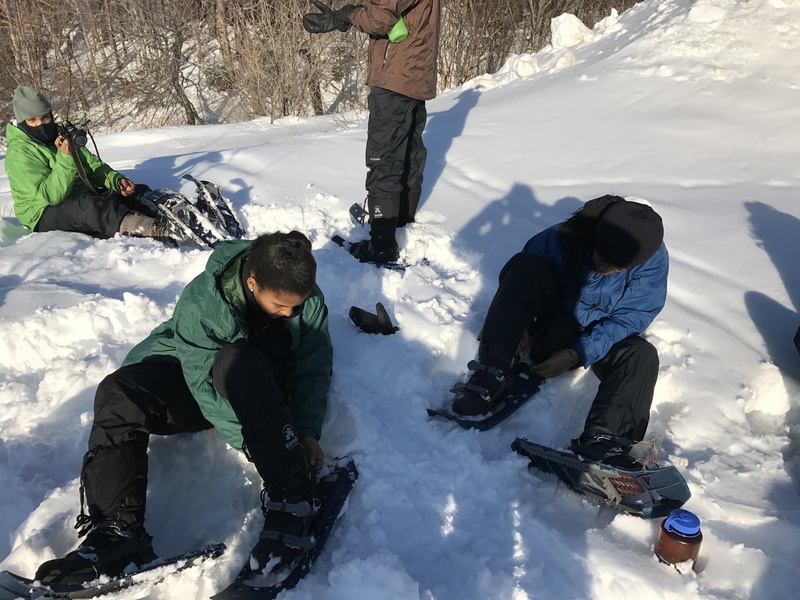 Due to the deep snow on the ground, we had to put on our snow shoes before heading out. After a few minute of walk, we found a plain area to settle and play some games. 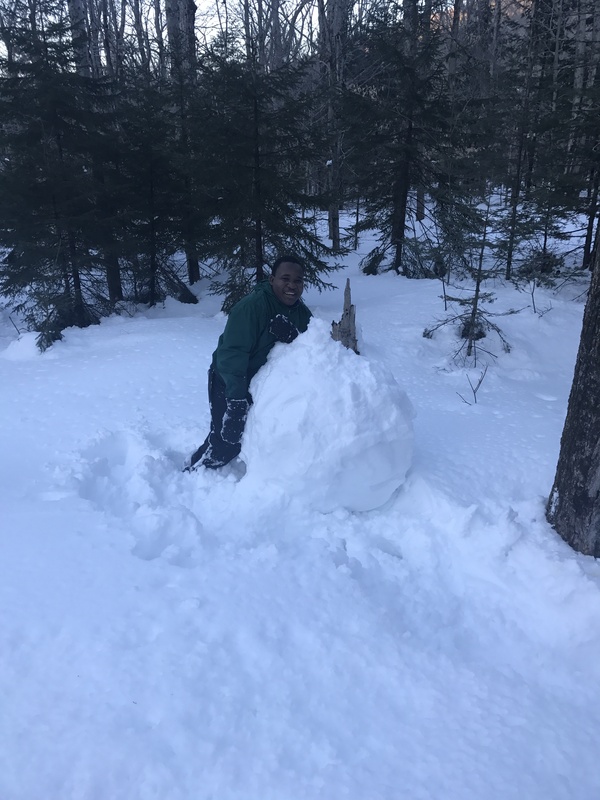 One of the games we played was to make a big snowball. Everybody tried to make the biggest snowball. At the end, the biggest one was nine feet wide. 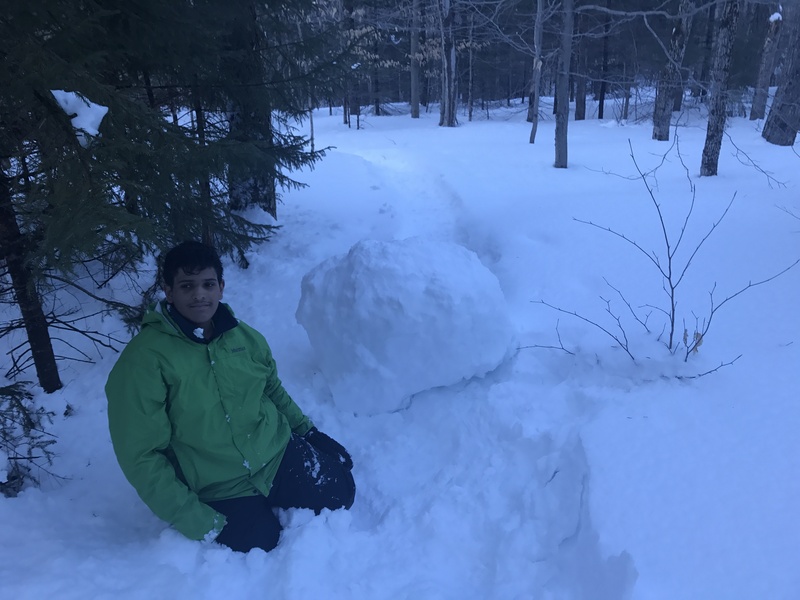 Ehab and his 9ft snowball! Innocent also with a 9ft snowball!! We came back to the bunkhouse after in order to settle down before dinner started at 7. 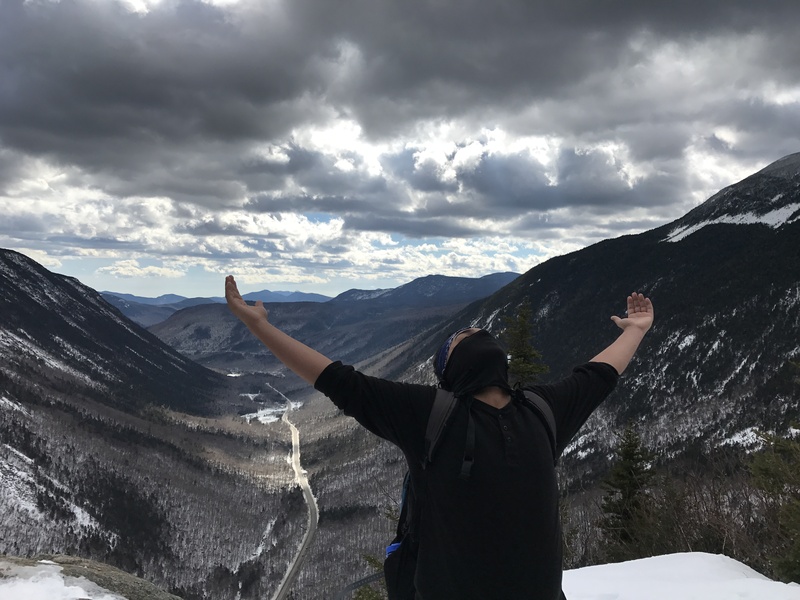 The next morning, after eating breakfast, we put on our winter gears and head out for our hike on Mt Willard. The hike was very long and tiring so we stooped for breaks. It took us about two hours to reach the top but it was worth it because the view was amazing. After eating dinner that night, we went out for a short night walk. This allowed us to look at our surrounding in a different way. The next day after a quick debrief about the trip, we headed back to Boston. 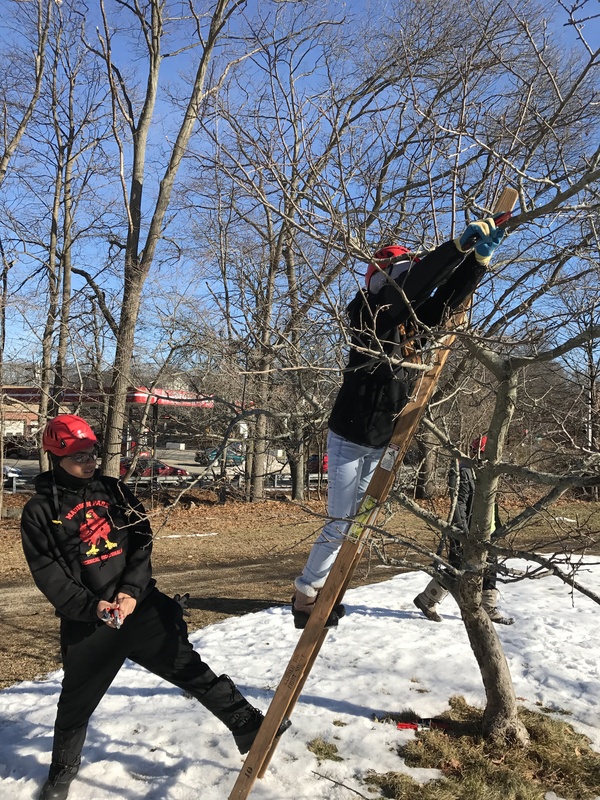 On Tuesday, the team went to Adams National Historical Park in order to prune out in the orchard. 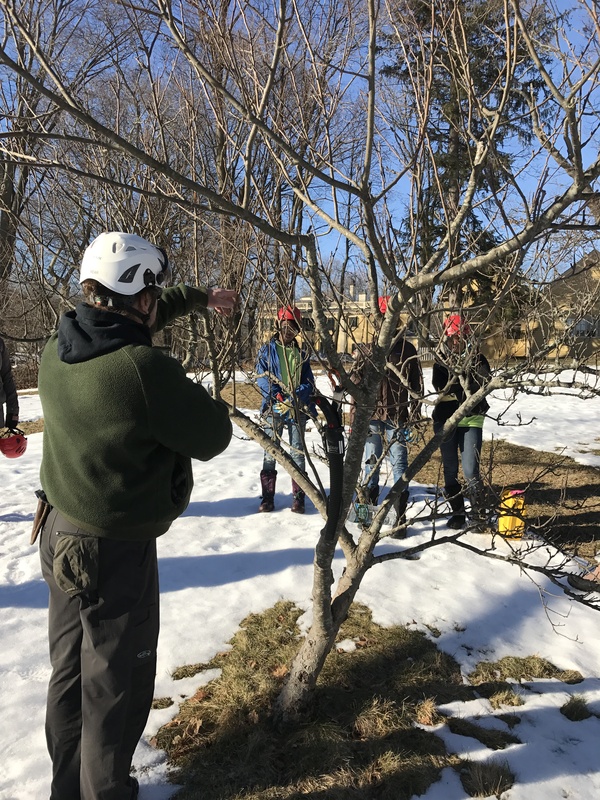 Jamie, Arborist from the Olmsted Center for Landscape Preservation, led the group and everyone got to learn a few facts about apple trees. One of them was that less pruning is more. If you cut too much off the tree, it would stimulate a lot of new growth later on so you have to cut off only about 25%. We first did an example one with Jamie where everyone watched while he showed us what to do. Then we split into three different groups in order to mix and match the Boston team with the New York team. It was a very fun experience since none of us had tried pruning before. It was also satisfying to see the trees become less crowded as we took off some of the extra branches. One of the trees in particular had poison ivy on it so we didn’t go near it. It was also fascinating to learn what poison ivy looked like. We also learned how to target prune to prevent injuring the tree. 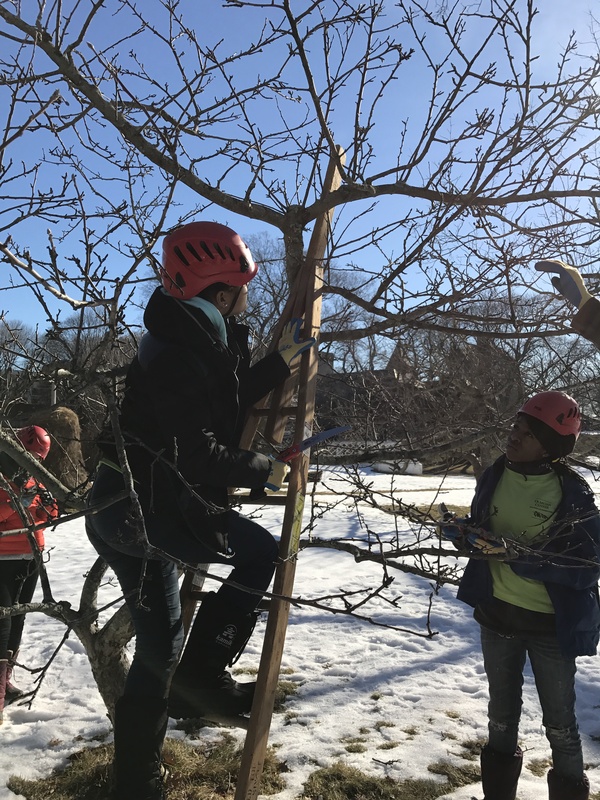 At the end of the day, we took back many things like knowing how to prune as well as some apple tree facts. We would definitely love to go back again next time since we all enjoyed the experience. We all worked well together and team work was one of the main themes that day and these past few days. Make sure you have a spotter when using the orchard ladders! 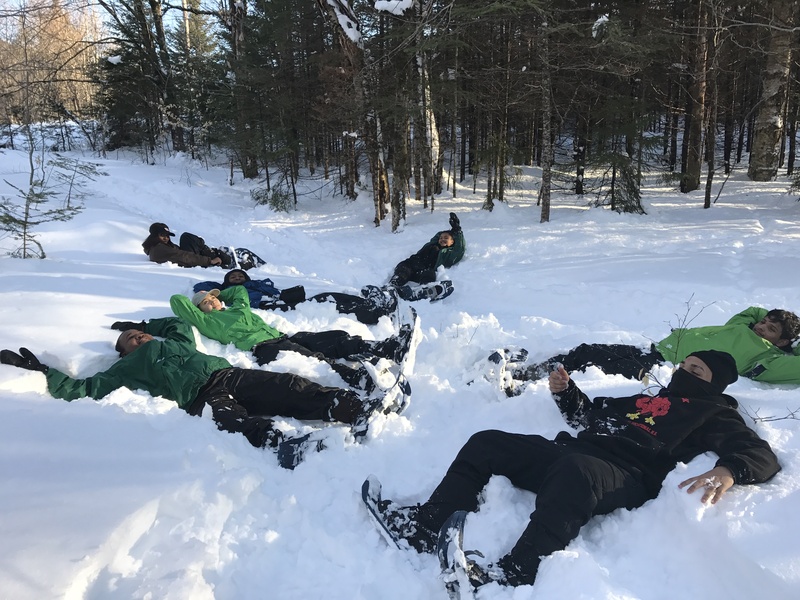 Everyone was pretty tired after snowshoeing!! ← Commandants House Garden Redesign – Final Planning Stage! We had a lot of fun with you guys.